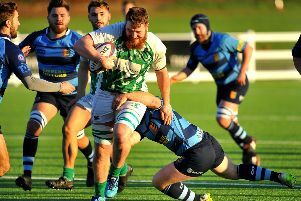 Pulborough got back into action and back to winning ways with an ‘ugly’ home victory that saw them narrow the gap on the top four in London 3 South East. After a free week spent licking their wounds from a heavy defeat at Folkestone, ‘Borough welcomed Bromley to Freelands and ran out 27-17 bonus-point victors. It was their sixth win of the season and saw them move on to 31 points from nine games. They are level on points with third-placed Beccehamian and two behind Old Dunstonians in second. Leaders Crowborough, having suffered just their second defeat of the season at the hands of Becs, remain on 37 points. Pulborough coach Clayton Saunders, while pleased with the win, was unhappy with periods of their play. He said: “It was a very frustrating game for a coach to watch. We were clearly the better team, but time and time again we either made poor decisions, or simply gave the ball away with a bad pass. “I think we had moments of the game where we managed to keep the ball for more than four phases. It was only then, we really manage to show what was possible. Bromley scored first going down the slope and only once the game was 20 minutes old, Borough started to apply the pressure, but this failed to turn into points. Just before half-time, after another good set-piece move saw Pulborough put some phases together and a good team try was finished off by Joe Serna in the corner and Frazer Oliphant-Hope converted for a 10-7 lead. Saunders was frustrated at half-time and made some positional changes which had an immediate effect as Sam Beesley was used in a set-piece move off a scrum and his big frame proved too hard for the defence to stop. 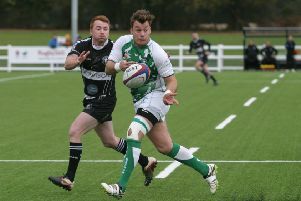 Moments later, the backs were at it again in a patient move that scrum-half Harry Bullock finished off for a 20-7 lead. Pulborough took their foot of the gas and allowed Bromley some precious time on the ball which resulted in a penalty and converted try. In the final quarter, the hosts again struggled to keep possession, before a late score sealed the points. A good move involving Oliphant-Hope, Connor Leeding and Dave Barber found Joe Johnson, who beat two defenders and put down the bonus-point try which was converted. Pulborough: Gue, Leeding, Baxter, Herron, Baldwin, Leddra, Serna, Goring, Bullock, Kilford, Beesley, Coombe-Tenant, Oliphant-Hope, Keating, Barber. Subs: Falk, Johnson, Roberts.